Ever since it was first written in the year 1300, "The Adventures of Marco Polo" has captivated readers with its amazing tales of adventure in the then-unknown and exotic lands of Asia, Persia, China, and Indonesia. At the time of its writing, the world was a much different place than we know it today; Venice, with its extreme wealth, was the center of trade for most of the civilized world and the Polo family - Niccolo and his brother Maffeo - were two of its most successful businessmen. Always seeking to enrich their fortunes by forming trading relationships with other lands, the Polo's made it their goal to travel to the Far East - a largely unknown world that was believed by outsiders to be uncivilized, dangerous, and far too threatening to enter let alone conduct business with. With the promise of great wealth awaiting them, however, the two intrepid brothers did not let the possible threats deter them - and, in fact, chose to bring Niccolo's young and impetuous son Marco along with them on the journey. Marco Polo was, at the time, an extremely young and rather frivolous man leading a life of ease and comfort based on his family's considerable wealth. As legend has it, Marco's father Niccolo had grown disappointed in his son's immaturity and disregard for his responsibilities and insisted that Marco accompany them on the journey. Polo refused, preferring to stay in Venice and continue his pursuit of pleasure, generally in the company of attractive young women. To impose his authority and force his son into adulthood, Niccolo had Marco kidnapped and imprisoned on the ship that would transport them on the first leg of their journey. Marco, of course, initially resented this - but it wasn't long before he began to understand and appreciate the thrill of adventuring. In its original form, "The Adventures of Marco Polo" became a best-seller - or, at least, as much of a best-seller as a book could be in a time when such things were all written by hand. It was eventually translated into most of the European languages and, though essentially a travelogue (albeit a fascinating one), it inspired explorers as renowned as Christopher Columbus, who found the promise of great riches in the far east strong enough an incentive for him to consider traveling there by sea. Given the legendary nature of Marco Polo's far-flung adventures, it follows that his travels would eventually make their way to the entertainment world - and in 1938, they did. 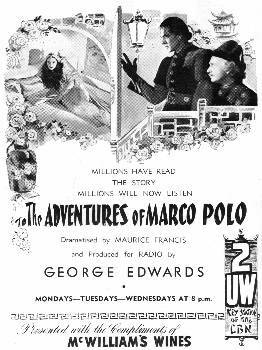 Starring Gary Cooper in the title role, "The Adventures of Marco Polo" was a big budget romantic adventure film that took the legend of Polo as its inspiration, if not for its plot. Despite being a mite outlandish and occasionally silly, this Sam Goldwyn-produced extravaganza proved vastly entertaining to moviegoers of the time and may, at least in part, have inspired the creation of a radio version two years later. "The continuity has been written with a sparsity of dialogue and rapidity of action, suited to the episodic nature of the presentation. As a result one is always left with the impression of intriguing happenings just ahead. This rapidity of tempo, combined with the element of mounting suspense, suggests that the serial will retain its grip on listener interest." Indeed it did. Research shows that the syndicated series was repeated many times throughout the 1940's and 1950's on Australian radio and also well-received in overseas markets, where it was distributed on 16" vinyl transcriptions. George Edwards, born Harold Parks in Kent Town, South Australia on March 11, 1886, always had a strong desire to be an actor. 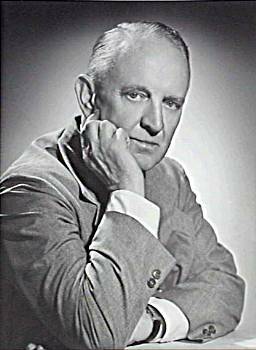 Beginning his career in an amateur theater in Adelaide, he eventually traveled to England to appear in musical comedy. His stage career was moderately successful, but it wasn't until he met and teamed with an ambitious actress named Nell Stirling that he was able to demonstrate his true talent as the "Man of a Thousand Voices". As legend has it, in 1933, Sydney radio station 2UE held the rights to a comedy thriller titled "Ghost Train" and offered seventy-five pounds to any production company that could produce it for radio. Normally such a budget would cover the cost of a complete script as well as a dozen actors to bring it to life - but Stirling, seeing an opportunity, had a better idea. She arranged for Maurice Francis to do the adaptation and hired a few actors for various roles, but saw to it that Edwards would play all of the other parts under phony names. The eventual performance went well and, at the end of the program, the announcer read the credits: actor, actor, actor, and the rest of the roles played by George Edwards. Fearing that 2UE would consider this to be more of a deception than a demonstration of his versatility, Edwards fully expected to be fired for misrepresentation. On the contrary: the switchboard was soon jammed with listeners wanting to know more about this George Edwards fellow who played all the parts on the wireless. George Edwards Productions continued to create radio series until 1953, though Edwards himself had gradually begun to slow down his activities a few years earlier. A combination of excessive drinking and a fondness for gambling finally led to his death at the age of 68 in August of that year. Yet his work continues to be popular with audiences; "Dad & Dave", an Edwards-produced comedy series that debuted in 1937, aired new episodes until 1952 - a total of 2,276 broadcasts in all - and is still being aired on Australian radio to this very day. As for "The Adventures of Marco Polo", modern listeners will find it to be well made, well acted, and extremely entertaining, especially for those who have seen the various television adaptations of the stories that have been aired over the years. Spread over a series of 50 quarter-hour episodes (two have not survived the years), the series has plenty of time to relate all the details of Polo's remarkable adventures - and George Edwards, who was already in his mid-50s when this series was made, is believable as both the young and romantic hero and as the wise and powerful Kubla Khan, ruler of China. Transferred from first generation master recordings and fully restored for excellent audio fidelity, the series' imaginative imagery and excellent scripting make it a delight for family audiences. If you've enjoyed the dramatic radio series produced by the BBC or spend time listening to current talking books, you'll enjoy traveling with Marco Polo to the romantic and unexplored lands of the east in this fully dramatized adaptation of his amazing, exciting, and action-packed journeys. This six-hour set contains the remaining twenty-five episodes of the series. Episodes #31 and #32 are not known to exist, but their absence in no way interferes with the flow of the action or the storyline. If you purchase Volume I, you will definitely purchase Volume II. This Radio Serial is one of the most intelligently written Radio Shows I have ever heard and starring George Edwards of British speaking Radio fame. I was not familiar with British Radio or the Radio Shows they produced, but after listening to this set and others offered through Radio Archives, now realize American Radio certainly had formidable competitors overseas of which previously I was unaware. HIGHLY RECOMMENDED for audio clarity and overall quality by the Radio Archives staff with one of the most intelligent and imaginatively written Radio serials from the Golden Age of Radio.